Twelve Against the Gods was an instant bestseller when it first published in 1929. 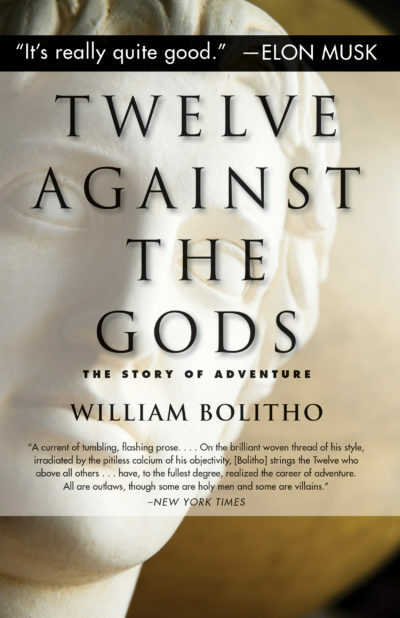 In his trademark journalist style, author William Bolitho details the lives of twelve great adventurers—Alexander the Great, Casanova, Christopher Columbus, Mahomet, Lola Montez, Cagliostro (and Seraphina), Charles XII of Sweden, Napoleon I, Lucius Sergius Catiline, Napoleon III, Isadora Duncan, and Woodrow Wilson. Bolitho shines light on both the struggles and successes that made these figures so iconic, and demonstrates how they all battled convention and conformity to achieve enduring fame and notoriety. “We are born adventurers,” Bolitho writes, “and the love of adventures never leaves us till we are very old; old, timid men, in whose interest it is that adventure should quite die out. This is why all the poets are on one side, and all the laws on the other; for laws are made by, and usually for, old men.” Though his essays are nearly one hundred years old, they encompass the timeless values of perseverance, bravery, and strength of spirit that have proven to resonate with the pioneers and thought leaders of today. William Bolitho Ryall (1891–1930), aka William Bolitho, was a South African journalist and writer who was a valued friend of the eminent writers Ernest Hemingway and Noël Coward.